If you have an office or a retail store, you may also have a security system that to alert you and the police in case of a break-in--or a webcam set up to monitor your business in your absence. But the capabilities of security systems go much further than they did even a few years ago, letting you monitor your business from a smartphone or tablet. Here's a quick look at some of the highest-rated apps by customers for surveillance in the Apple App Store and the Android Market, as well as an offering from ADT, one of America's largest commercial security companies. Some cameras sold for surveillance purposes come with their own homegrown smartphone apps, such as those made by Swann. Do-it-yourself types may prefer to set up a webcam or closed-circuit camera with an app on their Android or Apple tablets and smartphones. If you can't be bothered, consider tying in interactive services with a security company you're already paying. Despite the name of the app, it can also be used by a small business. It streams video so there is no need to use up your data plan by downloading video to your phone. The free version has limited live viewing and recording time. You may want to try downloading the free version to see if you like the interface, and then upgrade if you do. AtHome Camera is now also available on Android, although it wasn't rated as highly by consumers as the two applications we've listed under the Android section. 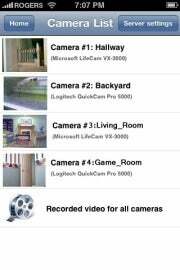 This app allows you to remotely view and control a Foscam IP camera. Foscam manufactures IP (internet protocol) cameras, which are a step up from traditional webcams and pack better features. iCamViewer lets you monitor up to eight IP or CCTV cameras remotely from your Apple iOS device. This app lets you monitor an area using an Android phone and an advanced motion detection algorithm, which triggers the phone to start recording when it senses movement. This application starts recording pictures and audio when it receives an SMS from a specified cell phone. The paid version gets you video and automatic uploads to YouTube. If you're more focused on running your business than on trying to be your own IT person, commercial security solutions let you check up on the workplace from a smartphone or computer. Alarm.com, YSP Security, and ADT are just a few offering these services alongside a more traditional business security system. ADT has licensed installers around the country that are devoted to businesses, from small to enterprise level. "Our local specialists will sit with the business to craft a solution that really fits their needs," says marketing director Robin Stennet. remotely, arm and disarm the alarm system, receive texts when the system is armed or disarmed, and control temperature, lighting, and small appliances onsite. You can do all of this from any Mac, PC, an Android handset, or an Apple device. ADT breaks down Pulse Interactive Business Solutions into three packages, which can be customized to meet a company's needs.. The one-time installation price for Pulse Interactive varies widely according to the equipment being installed and the size of the business, but typically ranges from several hundred to a few thousand dollars. Monthly monitoring charges for ADT's core service range from $50 to $100, and a business must be an ADT subscriber to get the service. Angela West's security system is a flock of blue jays trained to attack bird seed. She's written for big insurance companies, small wildlife control businesses, gourmet food chains, and more. Follow her on Twitter at @angelawest and Facebook.